BIMONK is dedicated to offer you a comfortable and cool air when working, travelling, sleeping in hot weather. Three settings are provided, so you can choose one according to your preference. Two power supply: you can run it with one or two batteries or USB cable. Besides, this fan also can be used as a power bank. It can charge your smart phone due to its current output port.120-degree vertical rotation makes cool air around your face. It is a good supply when camping, power shortage or travel. The strong airflow can cool you down in several minutes. Wanna get one? Just do it. To ensure that we meet your needs, BIMONK offers one year warranty for defective products. Incorrect human operation, including but not limited to disassembling, burning, soaking, and dropping it, is not covered by the warranty. 【Large Capacity】Comes with 2 button top lithium-ion 18650 2500mAh batteries. The fan can work with just one or both batteries. One battery can power the unit up to 3 to 6 hours and both combined can last for 5 to 17 hours. 【Power Bank Function & LED Night Light】The fan can serve as a power bank for your phone due to its USB output port. The LED light will be a great bonus for camping and it can create a great atmosphere to help you relax and have a sound sleep. 【Strong Airflow】With high-quality motor, the maximum fan speed can reaches to 4.2m/s for only having 3 fan blades. Cool you fast and effectively. 【Multiple Power Supplies】The fan can run with Button top 18650 Li-ion battery and USB-enabled devices like PC / Notebook, power bank, car charger, 5V DC wall charger, solar power bank, etc. 【120 Degree Rotation & 3 settings】 3 speeds :Low-Middle-High; 120 degree up and down. You can easily adjust the fan to the most comfortable speed and direct airflow exactly where and how you want it. 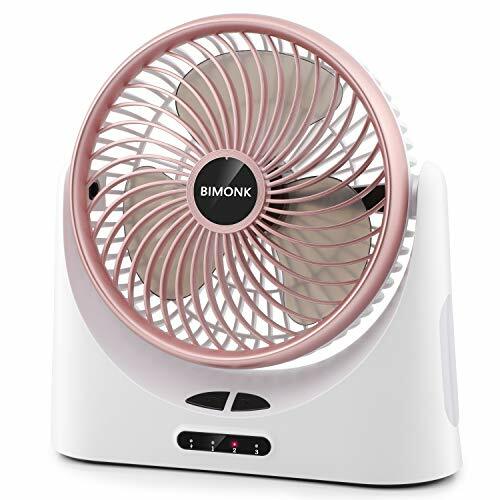 Bimonk offers one year warranty for any defective fan. If you have any problem or question, please write to support@bimonk.com. If you have any questions about this product by BIMONK, contact us by completing and submitting the form below. If you are looking for a specif part number, please include it with your message.